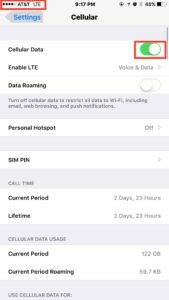 You are at:Home»iPhone»What Are Cellular and Data Roaming On iPhone? On or Off? You’ve had your iPhone for a few weeks and you notice “Cellular” as you’re perusing through the Settings app. You’re alarmed when you notice Cellular Data and Data Roaming are both turned on. If you’re still reeling from the roaming charges on your phone bill in 1999, you’re not alone. We’re all due for some up-to-date information about what roaming means for iPhones today. 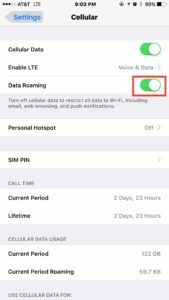 In this article, I’ll explain how cellular data works, what data roaming means on your iPhone, and share some tips so you don’t get burned by data overage charges. What’s Cellular Data On My iPhone? Cellular Data connects your iPhone to the internet when you’re not connected to Wi-Fi. When Cellular Data isn’t on, your iPhone can’t access the internet when you’re on the go. Where Do I Find Cellular Data? You’ll find Cellular Data in Settings -> Cellular -> Cellular Data. The switch to the right of Cellular Data allows you to turn it on and off. When the switch is green, Cellular Data is on. When the switch is gray, Cellular Data is off. When Cellular Data is on, you’ll see LTE in the upper left-hand corner of your iPhone. LTE stands for Long Term Evolution. It’s the fast data connection available, unless you’re using Wi-Fi. When Cellular Data is off, you’ll only see the signal strength bars in the upper left-hand corner of your iPhone. For almost everyone, it’s a good idea to leave Cellular Data on. I’m always on the go and I love to be able to access my email, social networks, and internet when I’m out and about. If I didn’t have Cellular Data turned on, I wouldn’t be able to access any of those unless I was on Wi-Fi. It’s absolutely OK to turn off Cellular Data if you have a minuscule data plan or you don’t need internet when you’re not at home. When Cellular Data is off and you’re not connected to Wi-Fi, you can only use your iPhone to make phone calls and send text messages (but not iMessages, which use data). It’s amazing that almost everything we do on our iPhones uses data! Let’s dive a little deeper into LTE. LTE stands for Long Term Evolution and it’s the latest and greatest in wireless data technology. In some cases, LTE can be even faster than your Wi-Fi at home. To see if your iPhone is using LTE, go to Settings -> Cellular -> Enable LTE. This setting turns off LTE so your iPhone uses a slower data connection, like 4G or 3G. If you have a small data plan and you want to avoid overage charges, you may want to choose Off. As I said before, our iPhones use a data connection for a lot of what we do. Nowadays, even your phone calls can use LTE to make your voice sound crystal-clear. Data Only enables LTE for your iPhone’s connection to the internet, email, and other apps, but doesn’t enable LTE for voice calls. You’ll only want to choose Data Only if you’re having trouble making phone calls with LTE. 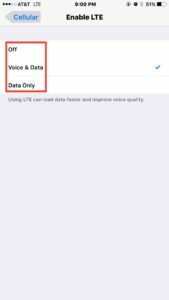 Do LTE Voice Calls Use My Data Plan? Surprisingly, they don’t. At the time of this writing, Verizon and AT&T are the only wireless carriers that use LTE for phone calls, and both of them don’t count LTE voice as part of your data plan. There are rumors that T-Mobile will add voice over LTE (or VoLTE) to its lineup in the near future. HD Voice from AT&T and Advanced Calling from Verizon are fancy names for what your iPhone calls Voice LTE. The difference between LTE Voice and regular cellular phone calls is staggering – you’ll know the first time you hear it. AT&T’s HD Voice and Verizon’s Advanced Calling (both LTE Voice) haven’t been deployed nation-wide because they’re so new. For LTE Voice to work, both callers need to have new phones that support voice calls over LTE. You can learn more about Verizon’s Advanced Calling and AT&T’s HD Voice on their websites. You’ve probably heard the term “roaming” before and cringed. Nobody wants to take out a second mortgage to pay their phone bill. What’s “Roaming” on My iPhone? When you “roam,” your iPhone connects to towers that aren’t owned or operated by your wireless carrier (Verizon, AT&T, Sprint, T-Mobile etc.). To access Data Roaming on your iPhone, go to Settings -> Cellular -> Data Roaming. Just like before, Data Roaming is on when the switch is green and off when the switch is gray. Have no fear: Data roaming has no effect on your phone bill when you’re anywhere in the United States. I remember when it used to, but several years ago the wireless providers agreed to do away with roaming charges for good. That was a big relief for a lot of people. This is important: Roaming charges can be exorbitantly high when you’re traveling abroad. Verizon, AT&T, and Sprint charge a lot of money if you use their data when you’re overseas. Keep in mind that your iPhone constantly uses data to check your email, update your Facebook feed, and do a slew of other things, even when you’re not using it. If you really want to be safe, I recommend turning off Cellular Data entirely when you’re traveling abroad. You’ll still be able to send photos and check your email when you’re on Wi-Fi, and you won’t be surprised by a massive phone bill when you get home. We covered a lot in this article. 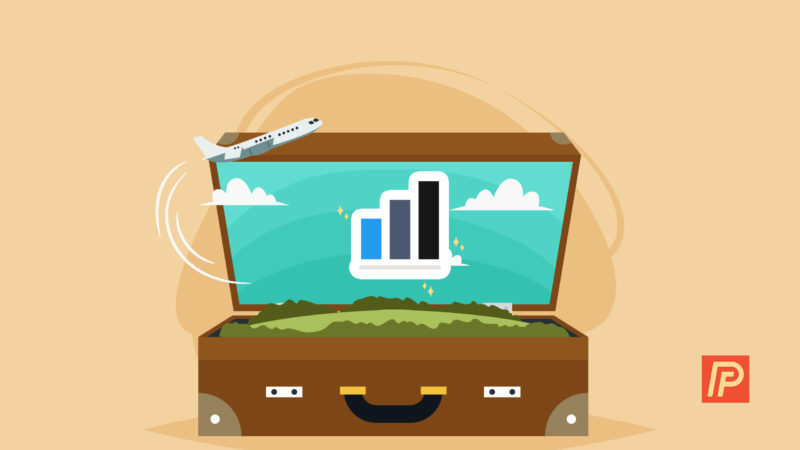 I hope my explanation of cellular data and data roaming on iPhone helps you feel a little more at ease when you use your wireless data connection. We talked about how to turn Cellular Data on and off and how LTE voice makes your voice calls crystal-clear. I’d like to hear your thoughts in the comments section below, and if you’re interested in learning more, check out Payette Forward’s article about what uses data on your iPhone. Previous ArticleHow Do I Block Unwanted Calls On My iPhone? A Quick Fix! Next Article iCloud Storage Full? Never Pay For iCloud Backup Again. I am Chris Pirone, I am a contributing writer here at Payette Forward. I have always been interested in technology since I was a kid. I started a career in technology when I landed a sales and service position at a corporate AT&T store. Since then, I have shifted my focus to social media and digital marketing, but I still stay very active and interested in the technology world. Me writing for Payette Forward was a no brainer because I enjoy talking about technology and helping people learn how to use it.